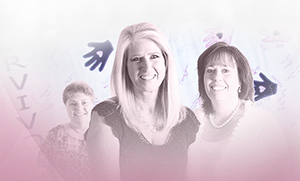 Find out about Kathy's journey at the Breast Health Center. 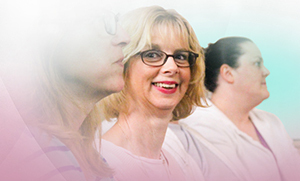 Meet Kathy Scherpe, a Breast Health Center patient. Kathy thinks it was God's will. She came in the day after Mother's Day for emergency gallbladder surgery. While in the hospital, she developed low oxygen saturation, so the pulmonologist came in and she had a number of CAT scans. After she was discharged, she needed a PET scan because they found a nodule on her right upper lung. They also found a mass in her right breast, which led her to the Breast Health Center. She had a mammogram and ultrasound there, and they ended up doing a breast biopsy. They took specimens from the lymph nodes, which were negative. She had a lumpectomy and then needed a revision done because the surgeon didn't check the margins, and there were still loose cells. When that came back negative, she was awaiting approval to start radiation. Talk about your meeting with Dr. Clanahan. He told her all her options, and her oldest daughter went along to take notes. What do you think of the staff at the Breast Health Center? The staff was excellent. She's had calls from Kim and said the familiarity of knowing people helps. Whether you're looking for an in-person or online support group for breast cancer survivors, they are out there.